Fundraisers are a great way to support the community and ensure help is available today and for tomorrow. ESCA CancerSupport began as a group of six people who met regularly to discuss, listen, and offer assistance in English to anyone affected by cancer. With the help of the local community, American Church (Emmanuel Church), YWCA, Bookworm Bookstore, Founex Sports Centre, American Community Hall, the group provided regular discussion and information meetings. Thanks to the continual generosity of the community, ESCA CancerSupport is still able to provide a variety of services for free to those affected by cancer. The Geneva Amateur Operatic Society (GAOS) is holding a Musical Evening that includes a variety of music, sung and played, in aid of ESCA CancerSupport. They are always pleased to welcome new members. ESCA CancerSupport will be at CERN to promote our cancer awareness services. There will also be a bake sale and some giveaways. We'd love to meet you! The fabulous team at IATA held an English Breakfast fundraiser and raised over 647 CHF for ESCA CancerSupport!! We'd also like to acknowledge My Expat Shop and their generosity. Thank you! ESCA CancerSupport's biggest party of the year. Our annual cancer awareness and fundraising event allows us to continue bringing free support to those affected by cancer: your neighbour, your colleague, your friend, your family, your caregiver. Face painting, magic shows, rowing competitions and of course the famous dragon boat race. Have a great time supporting a great cause! It's BBQ time and BDragons is holding a Summer Braai ! It's a great opportunity for an outing with family and friends and you'll be supporting ESCA CancerSupport's annual Paddle for CancerSupport fundraiser. 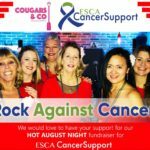 Hot August Night fundraiser to support ESCA CancerSupport. A night of music with the beautiful DIVA's. Dancing and a chance to win prizes. Let’s Party!! Cougars & Co. are hosting an evening of music and dancing to welcome the summer months. Have a rock’n good time supporting a great cause. More info click here. Christina Grivea and 'Bigfoot' Caroline trained for the Nordisk Extreme Mountain marathon in Denmark and raised funds for ESCA along the way. Incredible!! Spring is coming and it's time to tee it up! The International Golf Associates (IGA), led by our own ESCA member Barry Metcalfe, will be holding a Golf Tournament to raise funds for ESCA. Non-members of IGA are welcome to play. Prizes and good times to be had!